As many of you know (because I won’t shut up about it) I’ve been writing a novel about my experience in SE Asia in 2017. As part of this process, I decided to take a novel writing class through the UCLA Extension. 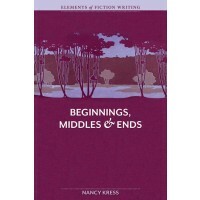 The class I got into is great but there was another class I couldn’t get into that recommended a book entitled, “Beginnings, Middles, & Ends” By Nancy Kress. Not only did I read that book, I really enjoyed it. If you are writing a novel/short story and want a great place to start, read this book. Or don’t, save yourself some time and just read this blog. Below is what I learned and would like to retain. – Once you find out what they want, make a list. All of those wants can become scenes. 1) The reader must understand your character’s initial personality, and especially her motivation. 2) The reader must see evidence that your character is capable of change. 3) The reader must see dramatized a pattern of experience that might reasonably be expected to affect someone. 4) The reader must see a plausible new motivation replace the character’s old motivation.